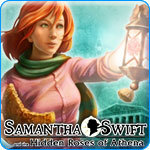 Samantha Swift and the Hidden Roses of Athena Game Review - Download and Play Free Version! Diverse locations from all around the globe. Clever tasks and mini-puzzles that span multiple areas. 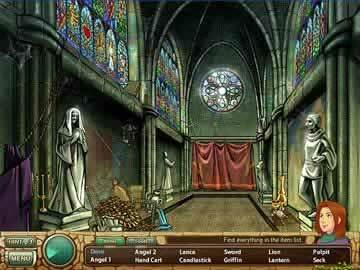 Good mixture between hidden objects and adventure game. A bit on the short side. Some tasks will seem too straight-forward. Rivals Seek Six Mysterious Roses! Samantha Swift collects lost artifacts for her museum and is now searching for the six roses missing from the Shield of Athena. But others are also seeking the same artifacts! Help Samantha track down the roses before her greedy rivals steal them away. Journey through several enchanting lands from Italy and France to Guatemala and beyond searching for special artifacts. In each beautifully-illustrated scene, Samantha will give you a list of objects to find. Some objects require that you find and use other tools in order to uncover them. Once you've found all the objects listed, you'll be given a final, very important item to find. On your journey you'll come upon some fascinating puzzles. Some puzzles will require that you move between various rooms to find the objects and answers needed. For example, you'll find a stone plaque with two missing levers. Improvise to replace the levers by finding objects like a miner's pick in another room. Then you have to solve the puzzle of the directions each of the five levers must point in. Other mini games include designing a zen rock garden and navigating a maze. It's fun to relax to this untimed game while venturing through beautiful lands filled with ancient history. But with the compelling storyline and adorable character of Samantha, you'll want to hurry up and keep playing until you reach the riveting conclusion! Enjoy learning new strategies as you piece together the clues and solve the puzzles to help Samantha. If you love epic puzzle-solving adventures, help Samantha find the six roses now and embark on an incredible journey that you'll remember for a long time! Here is a wonderful example of how to properly construct a casual point and click adventure game that integrates hidden object hunting flawlessly. Samantha Swift and the Hidden Roses of Athena sets you on a quest to search for both artifacts to return to a museum and tools used to perform actions to acquire other necessary objects in the area. You, Sam Swift, are a gifted young archaeologist in search of the lost Roses of Athens, bestowed to ancient Athens as the six virtues that were to represent the city. This quest leads across multiple continents to the far reaching corners of the globe to locate the sacred relics, from Rome to Guatemala, Tibet to Japan. Each new and diverse location is rich in color, culture, and history that adds much excitement to the game. Many of the tools collected to perform tasks are creative and will challenge your intellect, including hanging several chains and placing a column between them to knock down a road barrier. Items collected are also wonderfully diverse, including a translucent rainbow and numerous one-of-a-kind artifacts. One of the most noteworthy features of Athena is how well constructed game play is, with equal amounts of time being apportioned to object hunting as well as task completion. Mini-puzzles are certainly unique, such as conducting an archaeological dig or creating fire with nothing but several logs. On the downside, some of these tasks are rather simple and straightforward, reducing the value of their uniqueness. Furthermore, the overall length of the game is disappointing, and the more experienced adventure/hidden objects gamer will likely reach the finale in the matter of a few short hours. However, the game is well done with both an interesting plot and exciting locations, as well as the commendable ratio of object hunting to task completion and will keep most players entertained, both new and experienced. 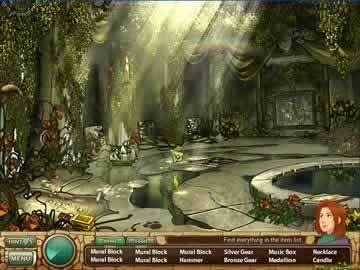 Get a quick glance at the hidden object gameplay and the inventory based puzzles to be found in this archaeologic quest.